Cedric Pulford is fascinated by the triangle of relationships between Britain, Buganda and Bunyoro. For this is the third book in 12 years he has written on this subject. 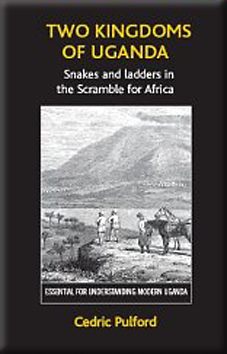 This latest book draws together material from Eating Uganda (1999) and Casualty of Empire (2007). The first book alleges that the British Empire swallowed up the Kingdom of Bunyoro 'bite by bite' whilst the second puts a dubious case that Britain owes Bunyoro reparations for wars fought in the 1890s. This latest book is much more balanced giving the 'rights' and 'wrongs' on both sides and draws in significant new material from the life of David Livingstone and the history of the Kingdoms of the Barotse in Zambia and the Ashanti in Ghana. Anyone who has served in the Colonial Service will know that each country is different making generalisations difficult. David Livingstone provides the 'back-drop' for this book. His vision of Christianity and Commerce opening up the development of Africa is realized in part in the history and development of Buganda and Bunyoro. "Livingstone called into being the career of one of the giants of African exploration - Henry Stanley" (p.l8). His meeting with Livingstone at Ujiji was a defining experience in his life. Henceforth he gave the rest of his life to work in Africa. His letter published in the Daily Telegraph in 1875 caused a sensation which caused the Church Missionary Society to send eight volunteers to Buganda, the most notable of whom was Alexander Mackay "the best missionary since Livingstone" . The translation of the Bible into Luganda not only gave the Baganda knowledge of Christianity but also taught them how to read and write. The Banyoro however, under the control of King Kabalega, adhered to Islam largely for nationalistic and political reasons and curtailed these opportunities. This led Lugard, having imposed law and order on the Baganda, to set in motion the concept of Indirect Rule by making Treaties with Buganda and the other Kingdoms, but not with Bunyoro who initially refused to join the Uganda Protectorate. The Mahdist capture of Khartoum imposing Islam on the Sudan ensured that Uganda looked to Mombasa for the development of its trade and not to the northern route down the Nile. Kabalega's long resistance to British rule led to development taking place later in Bunyoro than occurred in the other Kingdoms. This book gives wonderful insights into the circumstances and characters who have made Uganda what it is today. It is a mine of information and has an excellent bibliography. Having visited Uganda twice since the turn of the millennium I believe that relations between Uganda and the British are very good, not least between ourselves, the Banyoro and the Baganda. Chapter 18 Expatriates at Home and Chapter 19 The Mindset of the Masters explain this, and anyone who has served in the Colonial Service will find them very illuminating. Our Ugandan Archbishop of York, John Sentamu, sums this up wonderfully: "The British thought they were doing some good in the world. For me, the vision was what made the missionaries go out, made the empire what it was: the sense of education, better roads, infrastructure, the separation of the executive from the legislature. All these fantastic values which, as someone who was a recipient of them, I can look back and say : 'what a vision!'" Those of us who served in this great enterprise will find this book with its intimate descriptions of what happened between Buganda, Bunyoro and ourselves very fair and very interesting. It will reassure us that our work was not in vain!